Forster's Education Act of 1870 was intended to make education available for all children, but by the early 1880s the population of Orwell had grown to such an extent that the Colbatch Charity School was unable to accommodate all the village children. The Vestry (forerunner of the Parish Council) therefore considered a plan to enlarge the school building, (now a private house on the opposite corner of Town Green Road and High Street), and in 1881 a committee of 35 people, including the leading lights of Orwell Methodist Church, met to consider plans for an extension to accommodate seventy children. 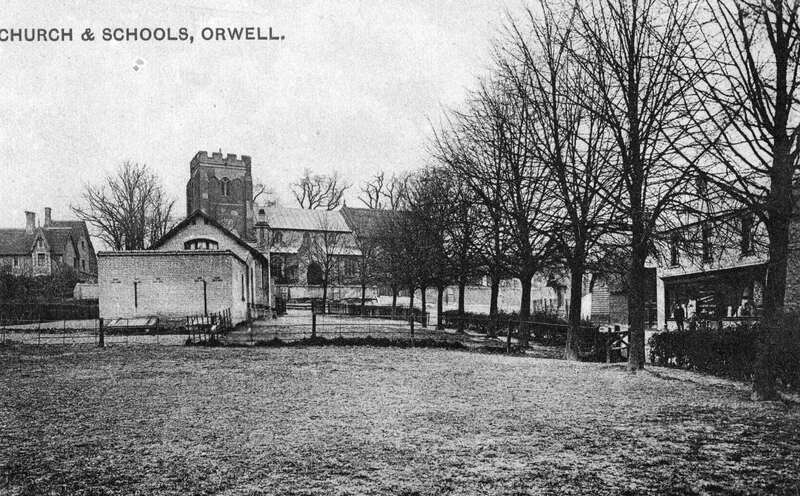 There were however objections from some of the Methodists, as religious instruction in Orwell's charity school was on Church of England lines and children of non-conformists had been admitted only 'as an indulgence.' Methodists such as shopkeeper Mr Huddlestone preferred that any additional educational provision should be non-denominational. The ratepayers of Orwell elected a School Board to tackle the problem.The first meeting of the Board was held in 1883 (on July 12th), with correspondence commencing in August of that year with the Education Department regarding establishment of an infant school in a separate building for 70 children. Mr Warboys' tender of £375 ,being the lowest, was accepted. Half an acre of Lordship Close was purchased from Mr Bendyshe, lord of Orwell Manor, for £75, (after some debate with Church Trustees regarding land at Church Close at a proposed value of £100). In April 1884, tenders for the proposed building (Architect, Mr Grant) were received from four firms (Willmotts, Plessors, Simonds and Warboys); Mr Warboys' tender of £375, being the lowest, was accepted. After some conveyancing delays, in July 1884 the Board borrowed £640 from the Public Works Loan Commission under the Elementary Education Act of 1873, with the Deed of Conveyance for the site completed in October 1884. The site now acquired, the builder commenced work in November, and school furniture (including 12 seats and desks 6 feet long, teacher's table, single cupboard and 6 additional chairs) was ordered from Mr Alderton of Cambridge. Twenty four Lime trees for planting around the playground (laid with gravel, not ballast!) were purchased at 2/6d each. It is uncertain whether the existing Lime trees are these original trees. Also in November 1884, requests for applications were sought from various Training Colleges for a School Mistress. In the December meeting of the School Board it was proposed and accepted that “the Mistress to be appointed be a Wesleyan”. The consequent advertisement in 'The Schoolmaster' was for a “certificated Mistress (Wesleyan) for Infant School, salary £60 per annum”. This reflected a distinct non-conformist bias among the Board members. In January 1885 they agreed to appoint Margaret Anne Rutherford as School Mistress and the school opened that month. Twenty seven children were admitted. With a Church of England School on one side of Town Green Road it seemed to establish a just balance to have a non-conformist influence on the opposite side.At an appropriate age, older pupils (equivalent to juniors) would then cross over the road to the Church of England School to continue their education.